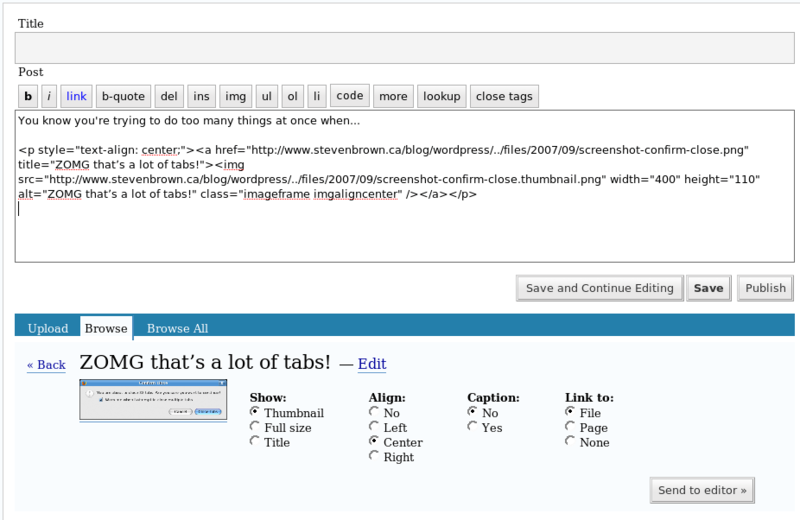 One things that WordPress is sorely missing is basic image handling. Blogging with images should be fast. Previously, I had gone as far as writing a script that would take all images in a directory, resize them, create thumbnails, and output the required html that I would then paste into the editor. Before that, I used a plugin that would would automatically generate thumbs, and it was great for a while. 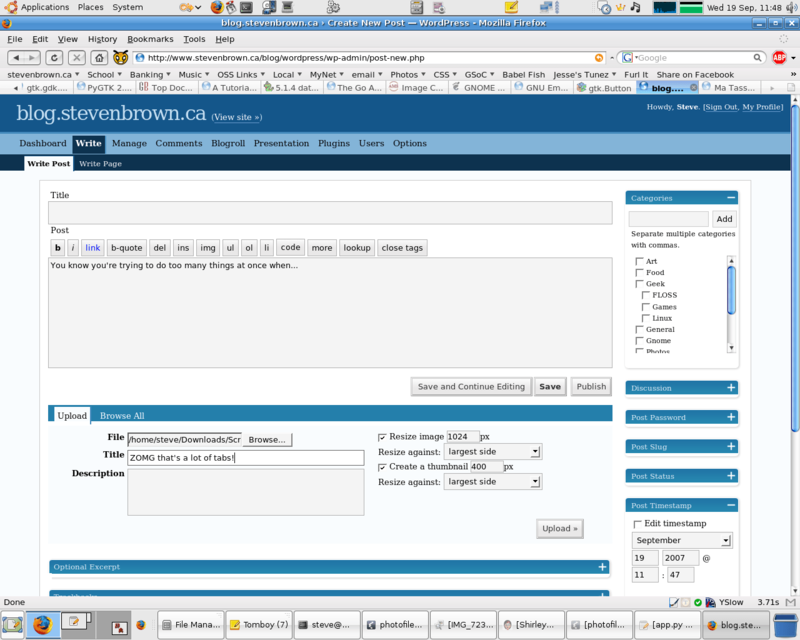 Until I upgraded, and didn’t enable the plugin… if you go see those old pages, you’ll notice they’re broken. So WP either needs a plugin that doesn’t break when you don’t have it installed, or a default will-always-be-supported image plugin. Since the latter doesn’t exist, I looked for the former. I’ve been using Flexible Upload for a while now, and it’s made posting pictures WAY less painful. Un-installing the plugin won’t affect any pages, because it just generates static content. So that’s what I use and recommend for uploading a couple pictures to a personal WordPress blog. Any other suggestions? This plugin sits in the Upload area…. Posted on Wednesday, September 19th, 2007 at 1:12 pm. 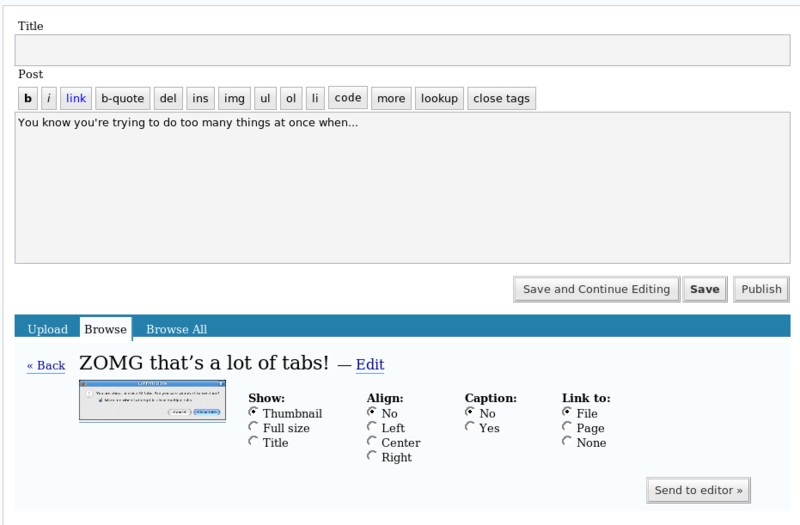 Tagged with: blogging, screenshots, WordPress.